I weigh more than I ever have before. I wear a bigger size than I ever have before. I have more soft folds than I ever have before. On the last flight I took, while the seatbelt fit fine the sides of the seat nearly left marks on my hips. Sometimes I don’t recognize my own face in the mirror. But today my son barreled into the office where I was working, clutching a bouquet from the grocery store. He’d picked it out himself, saying “I have to get mommy these pretty flowers!” And though he didn’t say it with words, I know he thinks I’m beautiful. I know this because I’ve always thought my own mother is beautiful. 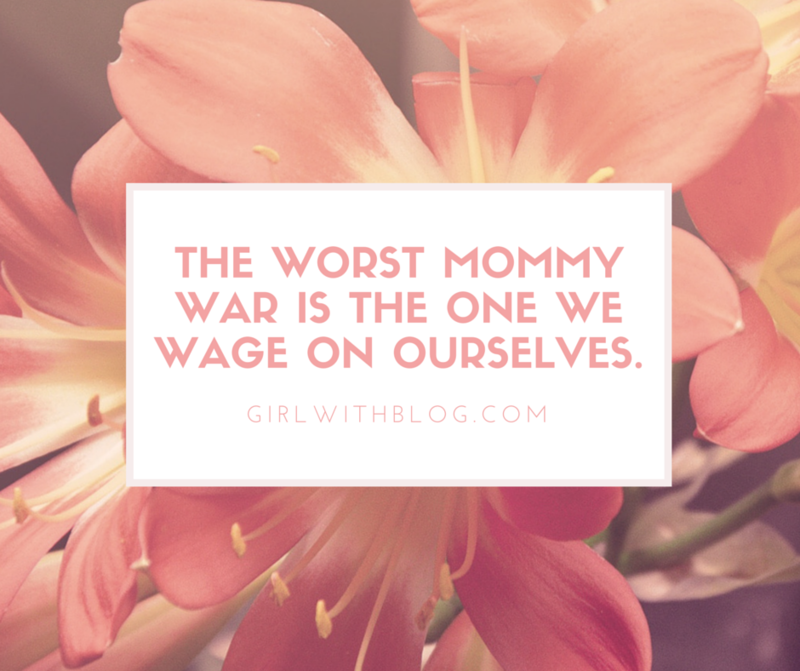 the worst mommy war is the one we wage on ourselves. The size listed on a tag does not – can not – define you. That soft, gently squishy stomach grew people. GREW PEOPLE. Those breasts that now sag did a miraculous thing – they fed babies. Thighs that touch speak to a strong body that carries more than the weight of itself. For all of these reasons and so many more, it’s time to declare peace with your body. To be kind to yourself. To whisper a thanks to your waistline for a job well done. Your children think you’re beautiful. Your husband gives you bedroom eyes. God fashioned you exactly as He pictured you in His mind. Let these be the measurements that matter. You, my friend, are beautiful!! For you are “fearfully and wonderfully made.” All the yeses to this post. Love Ya! You are seen my friend! Loved and beautiful; a precious daughter of the one true king. You speak to my heart today. Beautiful. So important for all of us to remember and whisper to our own hearts, over and over. Thank you. Love this, and the heart behind it. That last line… so good. I’ve been at war with my body for so long I can’t remember not fighting. Your words were a healing balm and a good reminder – thank you! Rebekah your heavenly Father ADORES you. Just adores you. LOVE! Thanks for sharing, Anna. Memories of us to our kids and friends will be about how we make them FEEL not how we looked. I’m getting the gist of this finally after losing both my grandparents in four months. I don’t remember much about anything but my Mama Stone’s shocking blue eyes and the easy talks on her front porch. The wisdom she shared from a hard life and the love of Jesus she had through it all. Her utter trust to not strive, but to pour into every life around her where ever she was. Father, let me be like THAT!